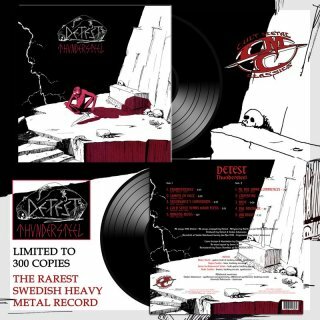 Cult Metal Classics/ Sonic Age Records, black vinyl, ltd 200, insert, This is possibly the rarest Swedish heavy metal record of all time, the EP of DETEST "Thundersteel", originally released in 1990 in micro quantity. Thanks to Janne Stark, we reached an agreement with the band and this vinyl edition also features 5 bonus songs, band story, lyrics etc. For the first time ever reissued on vinyl, this will be one of the most anticipated vinyl editions of this year, as the album in its original format was only owned by a handful of collectors.